The cryptocurrency market is still nascent. Analysts believe that the looming regulations and challenges may have tamed the prices to slump into a prolonged crypto winter. However, crypto spring seems to have arrived in style with a bitcoin blast off that saw the crypto surge by up to 20% within minutes. In the early morning hours of April 2, Bitcoin saw its largest positive surge in price for more than four months. 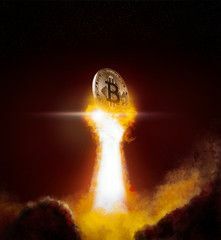 The most popular crypto climbed to a 2019 all-time high of $5100 registered on BitMex. The rapid price increase saw BTC reach the November 2018 prices. Also, the whole market cap followed suit and surged by at least $20 billion. The unexpected takeoff led to many analysts wondering what could have caused it. Some think it is just the normal technical analysis that prompted more buyers to enter the market. However, others believe that the bitcoin blast off took place due to a fools’ day prank. There was a publication circulated on April 1st. During April fool’s day, the news stated that the SEC had approved the Bitcoin ETF. The decision about this matter has been pending for almost a year now and it would represent good news for the markets potentially resulting in price spikes. The SEC story, sadly, was fake news and was just an April fool’s day joke. The magnate has also previously called the most popular digital currency a “rat poison squared”. Thus, it would be a positive injection to the markets if Buffet flipped to the BTC side and become a maximalist for the digital currency. But, that is all fake news.